Fake And Substandard Drugs Are A Huge Global Problem, Says World Health Organization : Goats and Soda Fake, substandard and expired medications are sold everywhere, from Canadian websites to pharmacies in Niger. Controlling them, says the World Health Organization, will be no small feat. 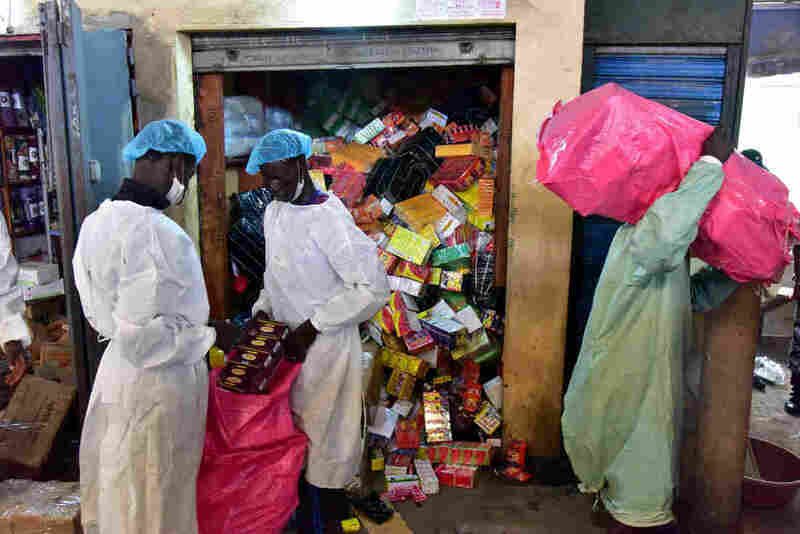 Employees from Ivory Coast's health ministry raid a shop selling counterfeit drugs at the Adjame market in Abidjan earlier this year. In a report released this week, WHO estimates that "1 in 10 medical products circulating in low- and middle-income countries is either substandard or falsified." That includes pills, vaccines and diagnostic kits. "We have reports from all over the globe, from countries rich and poor, and reports on all types of products, both innovative or generic, expensive or not," says Suzanne Hill, who directs WHO's department of essential medicines and health products. The findings are based on 100 peer-reviewed surveys on medicine quality from 2007 to 2016 spanning across 88 countries. There was the time when 200 people died in Pakistan after taking a contaminated heart medication in 2011. And there was the time when more than a thousand people were hospitalized in the Democratic Republic of Congo after taking a fake drug in 2014 and 2015. It turned out to contain an antipsychotic used to treat schizophrenia. In each case, people have profited from causing such harm, a dangerous get-rich-quick scheme. "It most certainly is, and it's also probably one of the oldest ones. There are episodes of counterfeiting that go back to the second century," says Kristina Acri, an economist with Colorado College who has studied the problem of counterfeit medications since 2000. "There is tremendous profit in this." Acri says she wasn't surprised by the extent of the problem reported by WHO. "I think what's interesting and important about the WHO report is that, since 2013, they've actually started collecting data. That is a huge step forward," she says. Forty-two percent of the reports of suspect medical products come from Africa, with 21 percent each from Europe and the Americas — though that doesn't necessarily reflect the location of the problem. "Just because you have more reports from a certain country doesn't mean the problem is worse there. It might just be that they're better at ferreting them out," Acri says. Drug shortages open up the door for counterfeit or substandard drugs to enter a market. When there was an outbreak of meningitis in 2015, pharmacies in Niger unknowingly bought expired vaccines from wholesalers. Or, when U.S. insurance companies stopped covering certain cancer drugs, a Canadian website filled the demand with fake versions. "If there is insufficient product on the market, within days, the vacuum is filled with falsified versions," says Michael Deats, an expert on medicine safety and vigilance with WHO. And in terms of counterfeit risk, he says, "location doesn't matter. It's about just as risky to buy medications from a street market in Africa as it is to buy them from an unregulated website in North America." In addition to drug shortages, stigma can also open the door to shoddy meds. Viagra, for example, is considered one of the most widely counterfeited drugs. "I think there are conditions — weight loss, erectile dysfunction, addiction — for which there's a stigma attached to them. Patients may be too ashamed to see a physician," says Acri, "and that opens the door to counterfeiters." So instead of going to the doctor to get those drugs, they'll buy fake versions online. There is a difference between substandard and falsified medications. Substandard products are licensed and approved, but they're of poor quality. That includes medications that expired, degraded during transportation or contained the wrong amount of active ingredient. Falsified drugs, on the other hand, deliberately deceive people about their contents or origin. Regardless of the category, such products can injure and kill people. As part of its report, WHO commissioned groups with the University of Edinburgh and the London School of Hygiene and Tropical Medicine to estimate how many deaths in sub-Saharan Africa might be caused by poor quality or counterfeit medication. They estimated that at least 72,000 children die of pneumonia and 69,000 people die of malaria each year as a result of falsified or substandard treatments. Beyond failing to treat individual patients, such drugs can also contribute to growing global problem of bacterial resistance. "Antibiotics and antimalarials are the two highest categories of suspected drugs reported to the WHO by far," says Deats. "Both of these can contribute to antimicrobial resistance" if a drug contains a weaker dose of antibiotics than what is required to quash an infection. Drug-resistant bacteria like tuberculosis and malaria don't respect international borders, regardless of how wealthy a country might be or how regulated the drugs are. WHO estimates that 10.5 percent of medicines in low- and middle-income countries fail to treat the condition they're supposed to. "A 10.5 percent failure rate on medical products is unacceptable anywhere in the world. And that threat is growing, not diminishing, because it is a huge underground industry, a very profitable criminal industry that is even threatening our secure drug supply chain in the United States," says Kenneth McCall, a professor of pharmacy at the University of New England. McCall works with the Partnership for Safe Medicines. The group recently connected dangerous counterfeit pain medications laced with fentanyl, which is 50 times more powerful than heroin, to deaths in 12 U.S. states. "We know that it's contributing to the opioid crisis in the United States," says McCall. Unfortunately, easy solutions are hard to come by because the global trade in bad drugs isn't the work of a few evil masterminds. "In the last four years of the surveillance program here, we've seen clandestine factories that have been making substandard and falsified medicines in every WHO region. We've seen them in developed countries. We've seen them in developing countries," says Deats. Often, the packaging will come from one country, the contents come from another, and assembly happens in yet another. "I think regulating the supply chain is a starting point," says Acri, the economist from Colorado College. Laws that require tracking medication from production to sale, like the one the U.S. is phasing in, might not be feasible in other countries. But, as WHO report points out, something as simple as better trash disposal at hospitals could help get rid of expired pills or vials that could easily be refilled and resold.